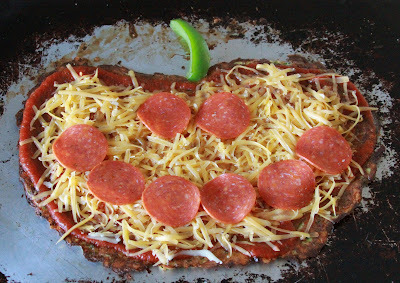 Look at that super cute pumpkin of a theme pizza!~ I am so excited about it because it’s made with my uber fabulicious zucchini pizza crust, and just in time for the most fun holiday evar (it brings out the kid in all of us). And not only is it made with my fabulicious pizza crust, I’ve revamped the recipe. So cool! Better yet, it’s still incredibly low carb, gluten free and easier than ever to make. And, as per usual, this is gluten free! You can definitely still hold it in your hand, arguably even better than before (make sure to wring out the zucchini after grating to squeeze out some of the excess moisture). Try it and see what you think! One thing’s for sure: It’ll be a frightful delight for the ghouls and boys at your dinner table. Oh yes. I went for the cheap pun. Just look at Mr. Pizza before he goes into the oven to get all melty and delicious. Who couldn’t love that face? Your kids are going to flip (and maybe everyone else, too). 3. On a greased cookie sheet, form zucchini dough into an oval and shape out like a pumpkin (This will look like a flattened heart). Be sure to keep dough as even as possible (no thick and thin spots for even baking). 4. Bake for 12 minutes or until bits on the top begin to turn golden and edges are golden-brown. 5. Using a metal spatula, carefully work your way around the pan, lifting dough gently, to separate from the pan. Grab a second spatula and flip the crust (if this freaks you out or the dough is too thin, leave it as-is and skip step 6). 6. Bake for 5 more minutes. 7. On baked crust, spread sauce and cheese; make a face from pepperoni. 8. Bake again until cheese is bubbly and golden, about 5-10 minutes. 9. 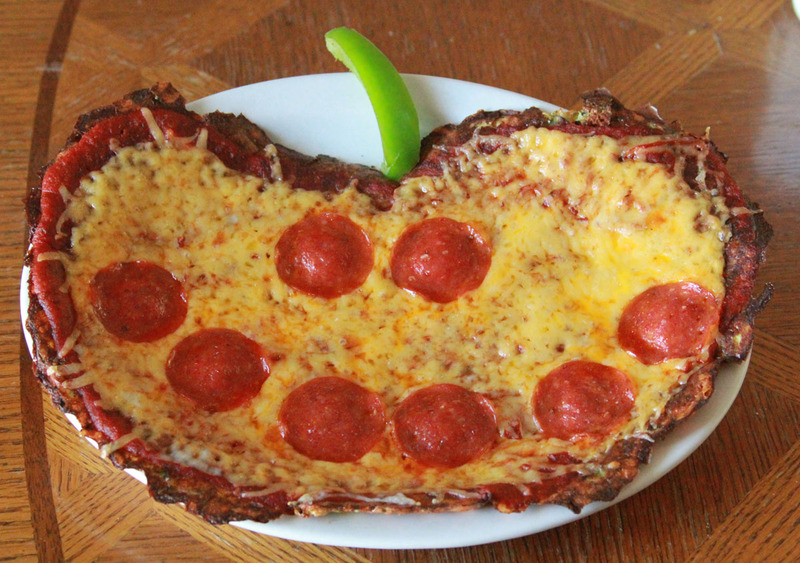 Cool for 5 minutes, add the strip of green pepper and present your boo-tiful dinner. Refrigerate leftovers. Makes one large or two smaller pizzas. isnt this supposed to have eggs in it too?? You are totally right. You can omit the eggs, but they definitely help bins the recipe together. Thanks for the catch! Looks so yummy! Does the zucchini get peeled before grating? Hi Robyn Liz! No, I don't peel the zucchini. I just cut off the ends and shred the rest, seeds and all. It makes things so much easier! I just made this and I have to say amazing! I should have drained the zucchini a little better, but other than that – super happy. Do you think this would bake up like a crust if I pureed all the ingredients together? My husband has an issue with grated food texture. I would say so, absolutely! You might not even need the egg, since the cheese is also a binding agent.